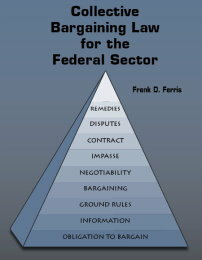 Written by Frank Ferris, a labor relations practitioner since 1971, Collective Bargaining reports and analyzes hundreds of precedents that shape collective bargaining law offering commentary and best practice tips. Chapters are titled by using the FLRA�s language for ease of use. Each chapter focuses on short excerpts from the key cases stating the legal rule. Many chapters close with a comment on how to best comply with the law and a discussion of the flaws or inconsistencies in current case law. Also includes a detailed table of contents and table of cases.